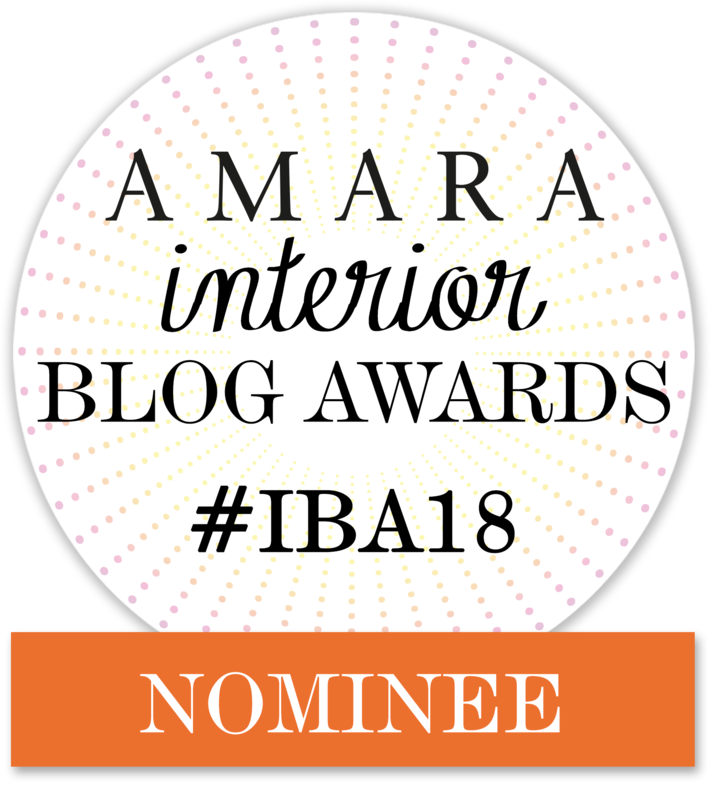 It’s finally here – Reveal Day! Ooooh you guys, this is so exciting! 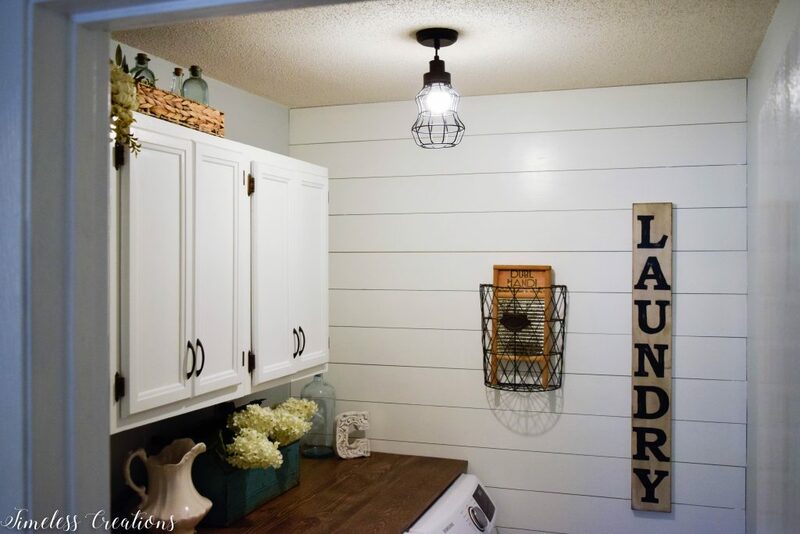 It is the 5th and final week of the $100 Room Challenge where we just made over my laundry room. 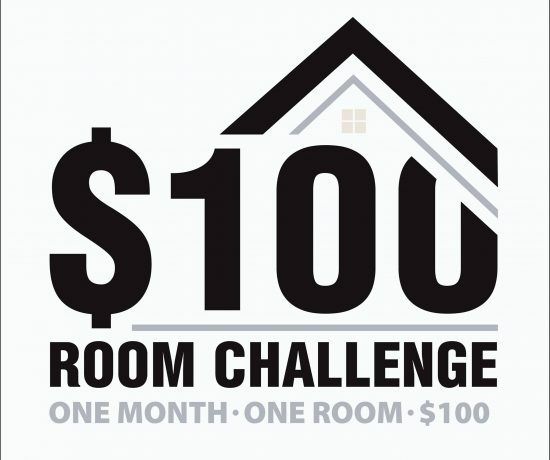 One room, one month and only $100 as a budget. 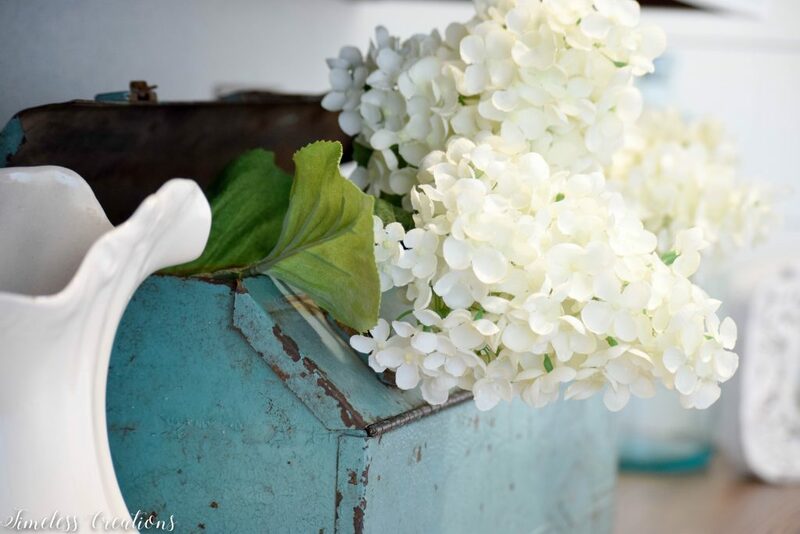 This challenge, which is hosted by Erin from Lemons, Lavender, and Laundry is one of our very favorites to participate in. 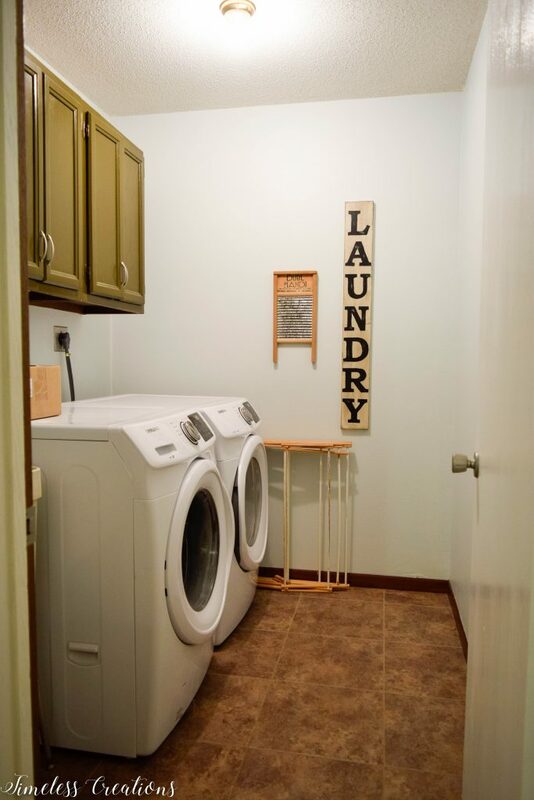 And friends, I am absolutely in LOVE with my new laundry room! 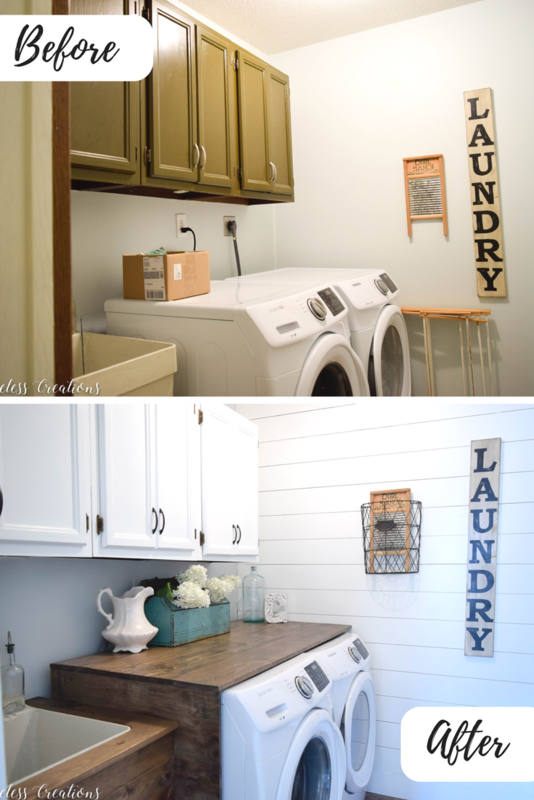 Without further ado, here is my $100 Laundry Room Reveal! 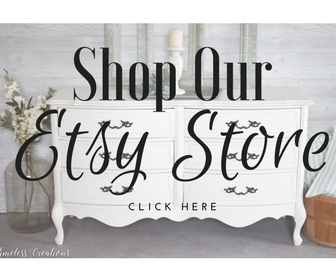 For your convenience in finding products we love, this post contains affiliate links. For our full disclosure, click here. The room wasn’t absolutely terrible. It had nice floors, recent light aqua paint, enough space, a sink, but it was all so….blah. And now for the “After”, come on in! Ta Da! Can you believe the change?! The first thing on my checklist was to add more interest by creating a feature wall. And what better way to achieve that than to add some shiplap! (See how we did it HERE) Of course, this being the $100 Room Challenge the shiplap had to be faux in order to fit in the budget. So we ripped down some 1/4″ plywood sheets, nailed them up,(using our new Nail Gun!) and painted them white. We also painted those terrible brown cabinets a nice off-white from the same paint we had leftover from our kitchen cabinets we painted previously. 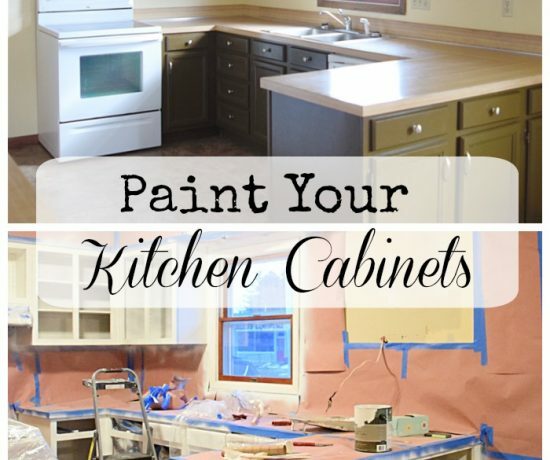 (For more info on painting cabinets click HERE). That was important in this challenge – we used a lot of leftover items we already had. 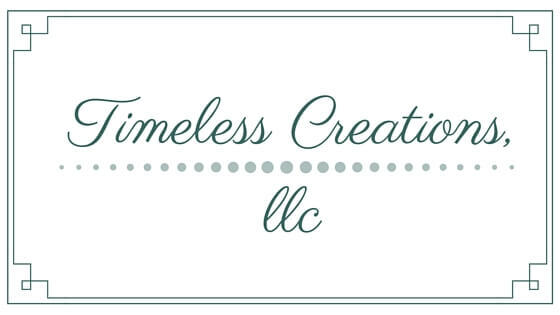 (Paint supplies, primer, paint, stain, sealant, and spray paint were all items we had on hand.) We also decided to spray the silver handles to match the brown hinges. (We used THIS spray paint). At the beginning I wasn’t sure if we were going to spray the hinges to match the handles or the handles to match the hinges – but boy am I glad we went darker! 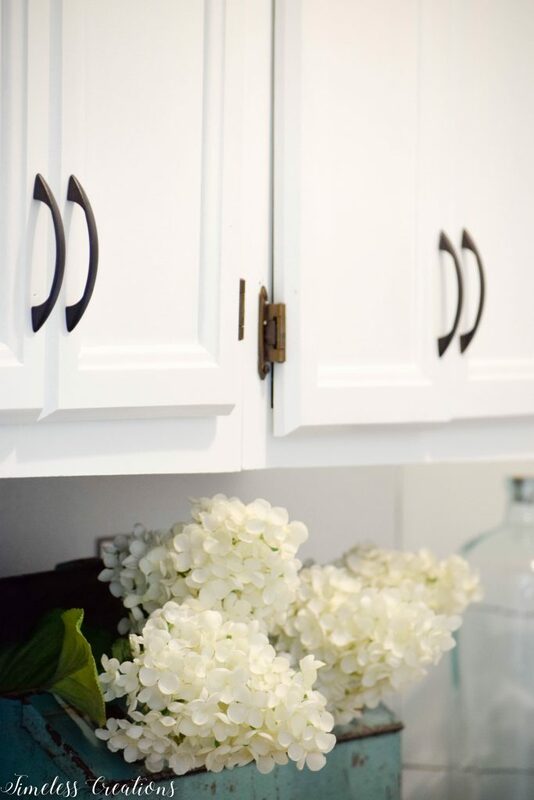 I actually want to change all of my hardware from my kitchen makeover to match this look now! And just this last weekend we were able to finish everything up! It wasn’t a short list either. We had to put the cabinet doors back on, paint trim, install the folding counter, create that surround on the utility sink, paint the utility sink legs and decorate. Whew! And we finished it all with a day to spare! It was much easier than our first plan and it looks great! My husband and I are very happy with the result. 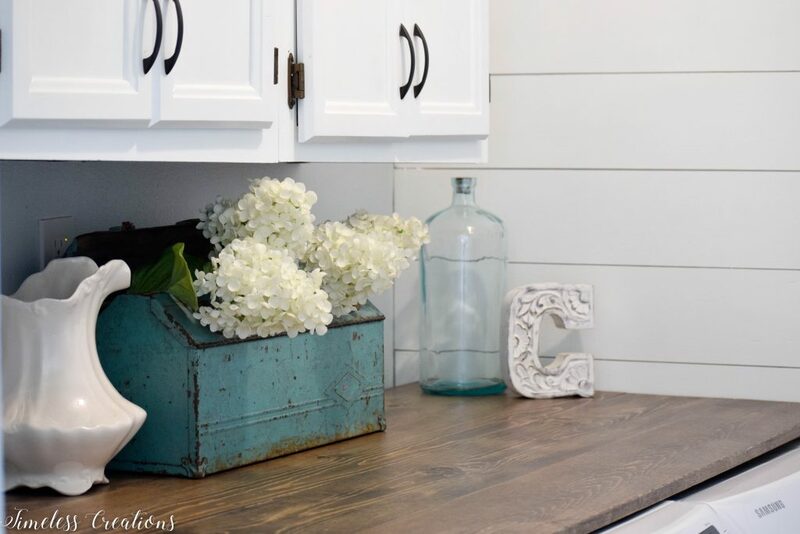 I could have kept the remaining money and come in under budget, however, I found that cute little woven basket and knew it would be perfect under my sink! So I grabbed that too, and came back to put my laundry room all together again. 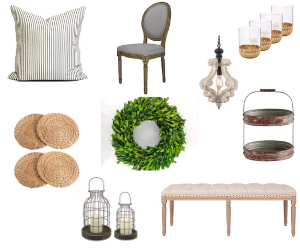 The rest of the decor were all items I had. Some were in storage and some were just around the house. That beautiful vintage tool box became the perfect way to hide all of the cords and hoses from the washer and dryer. It also brings some great color to the space. 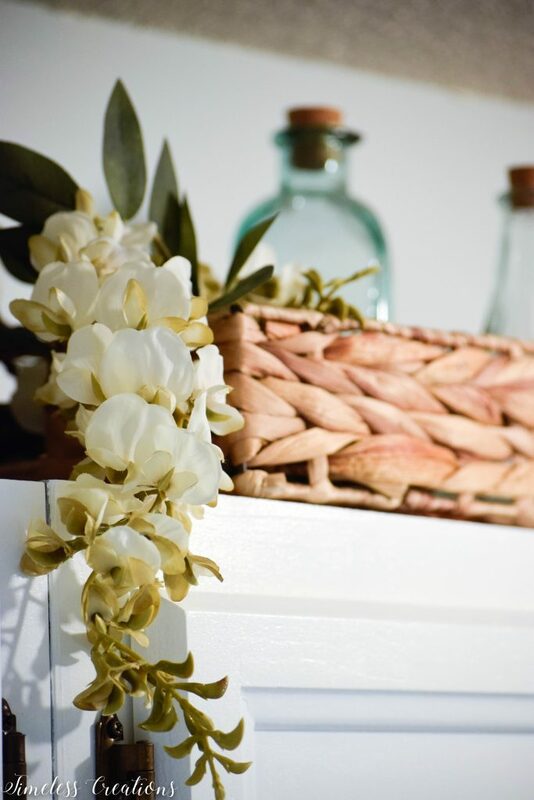 I liked the addition of the lighter brown woven basket under my sink as well as the vintage washboard so much, I decided to bring my woven tray into the room too. The lighter color and nice woven texture brings some added interest into the room. And I’m doing a little happy dance! 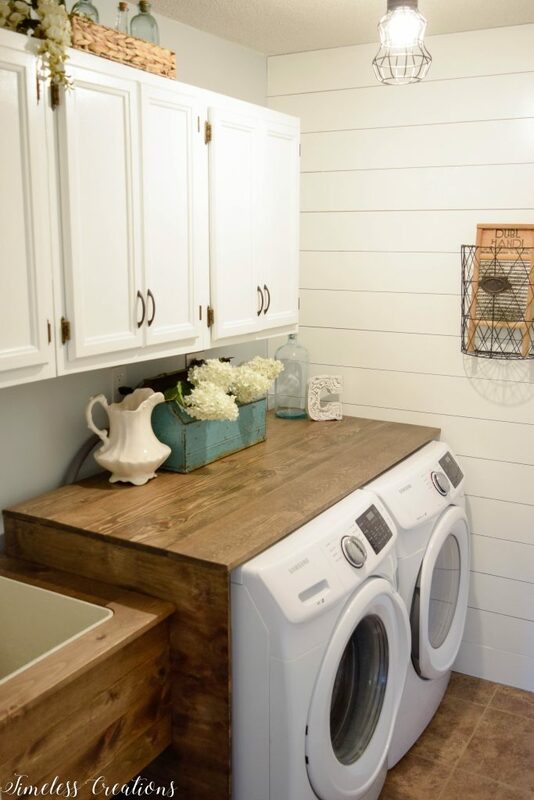 One beautiful new laundry room for under $100! 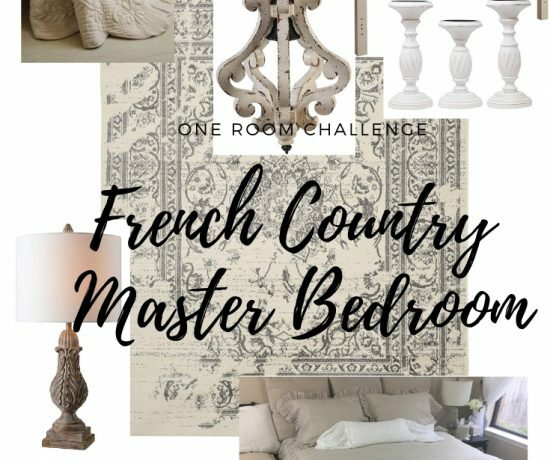 Make sure to check out how all of the rest of our friends did with their rooms for this challenge – the links are below. Thank you Stacey! We love it too!! Truly gorgeous! 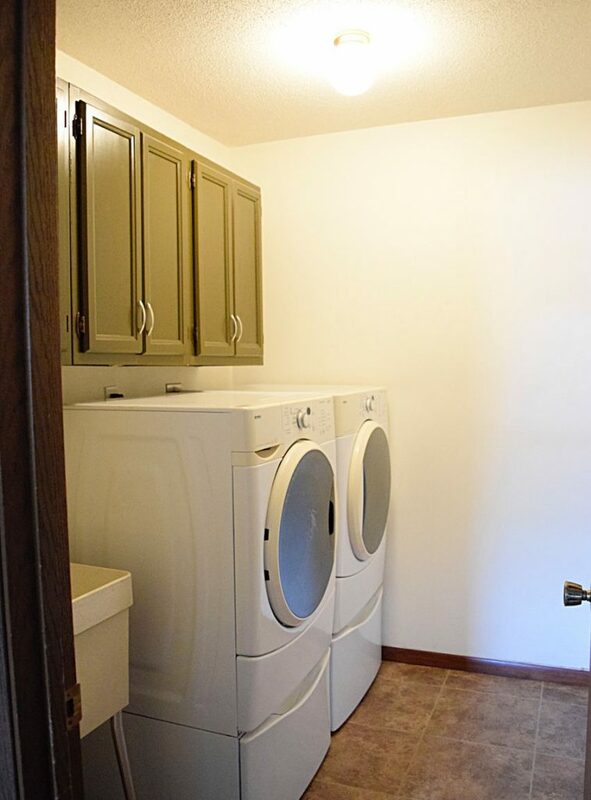 This is a laundry room you want to spend time in. I love all the warm wood tones with the crisp white. Great job! Thank you Patti! I love that look of wood with white. It’s so pretty! I can’t get over that sink! It’s amazing!! Haha! Thank you Emy! 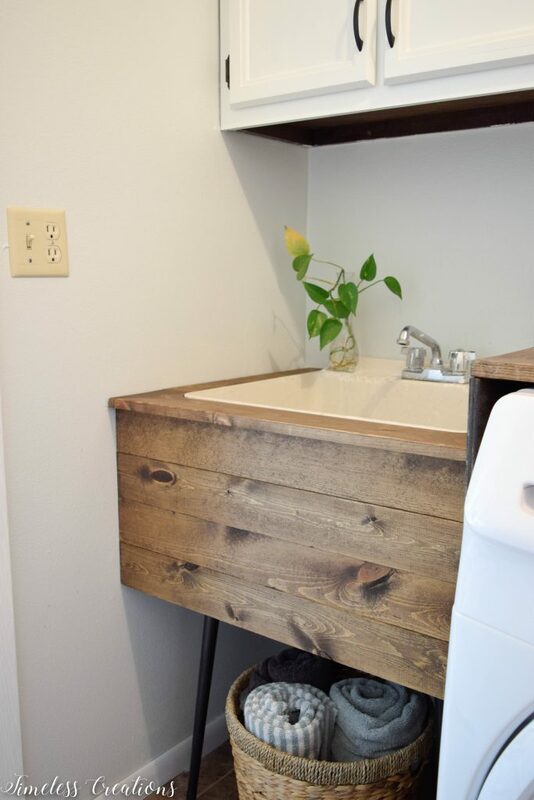 We are so happy with how that sink turned out! Haha, I don’t mind laundry actually. But it makes it so nice to have such a pretty space. Thanks again for hosting Erin! 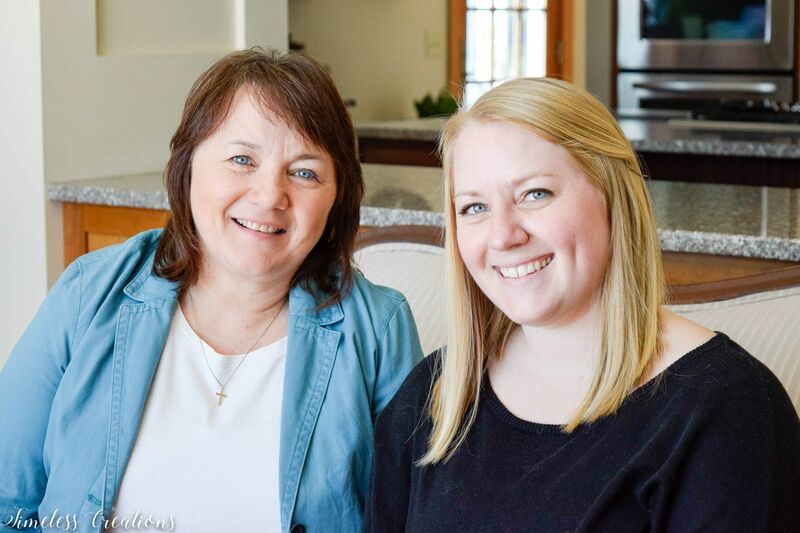 We hope to continue joining in all the time – we have a ton of rooms that can be made over! This turned out SO awesome! I love the wood front on the sink. The painted cabinets are a game changer. 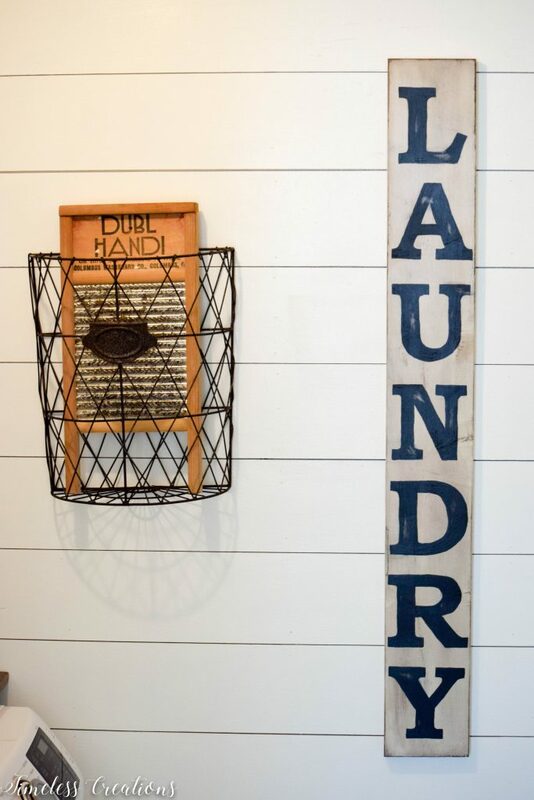 I have pinned this for my upcoming laundry room makeover. Thank you for inspiring me! You are so welcome Gabby! Serious Game changer in those cabinets for sure! I’m pinning this! I can’t believe you made that sink surround out of wood. That’s amazing! Thank you Emily! It was so simple actually! 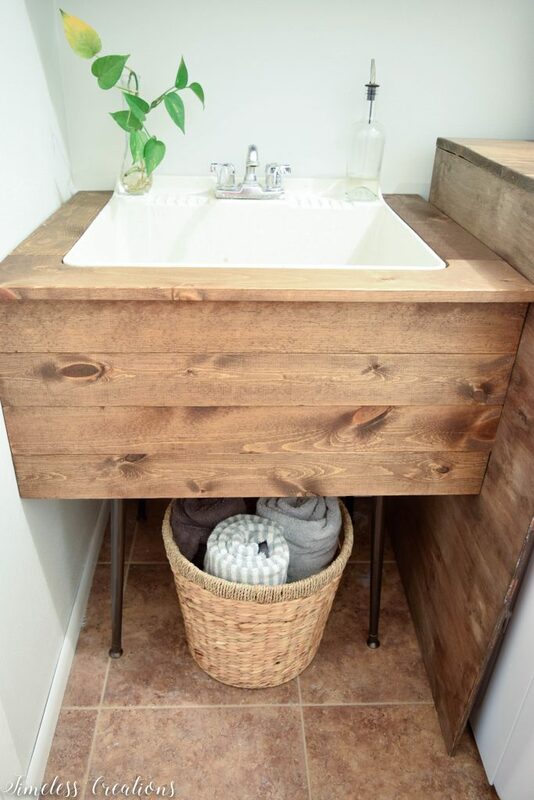 I especially love the wood apron you built around the sink! Very stylish. Thank you Nikki! We love that darn sink now too! I am OBSESSED with how you redid this SINK! The whole room is amazing! Great job! Thank you Rebecca! We are so happy with how that sink turned out!! Wow! It looks so good. Can’t wait to see the tutorial for them sink! It looks s’obstiner much better! Wow! I can’t believe how much you got done in such a short amount of time. It looks fabulous! Thank you so much Shelley! We are so happy about this transformation! Absolutely stunning makeover! Love the ship map and the wood counters especially! Thank you so much Kendra! We love it too!! The sink counter and surround!!! So cool, I love it! Your room is beautiful, congrats! Thank you Jackie! I’m so glad that sink turned out so well! Aaaahhhh! 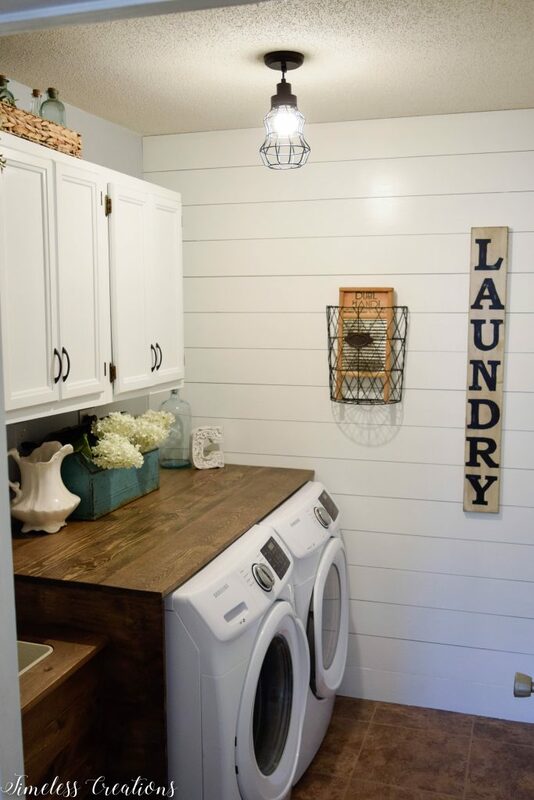 I’m in love with a laundry room! It’s beautiful and you guys are so creative with the folding counter and that sink surround. Your decorating is gorgeous and it’s such a happy place to do laundry! I love it! It is a happy place to be! I am just in love with it as well. Thank you so much Melissa! Oh wow, I am loving this space! 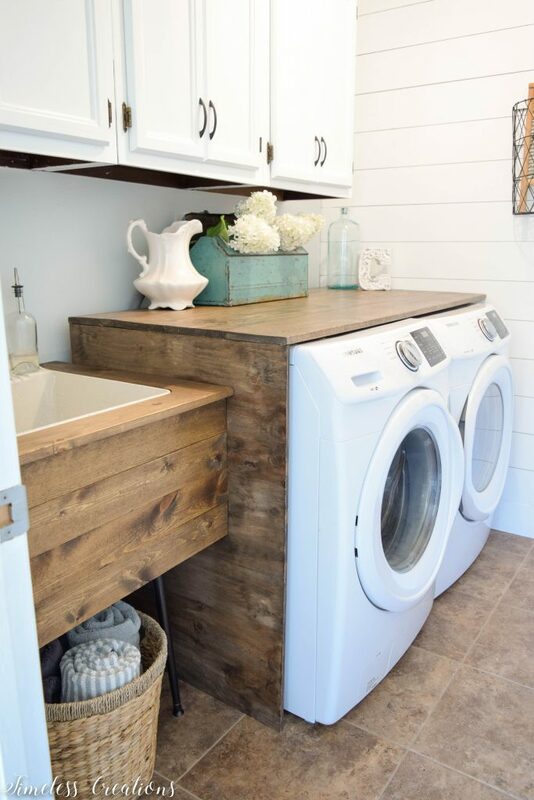 That wood sink surround is just beautiful! I’m so jealous of your folding counter. Love everything that you did here! Ok, this seriously is one of the best before and afters ever! 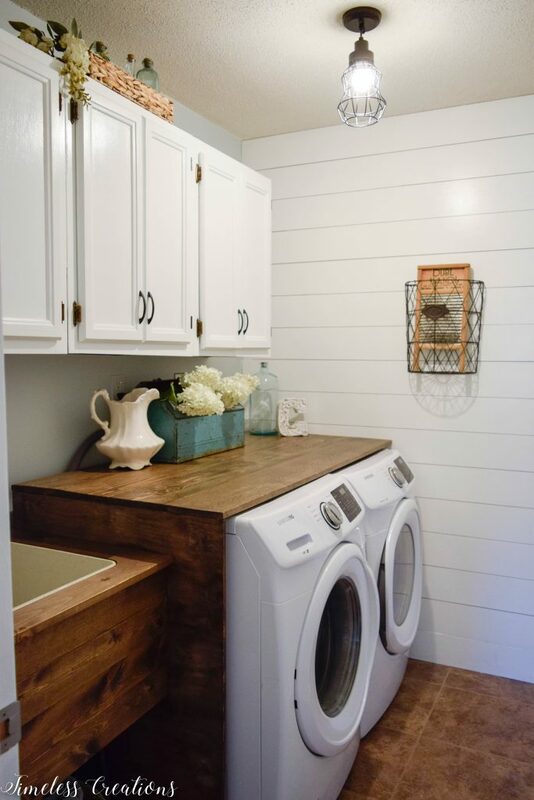 I love how you balanced all the white shiplap and wood. It’s so bright and pretty in here now. 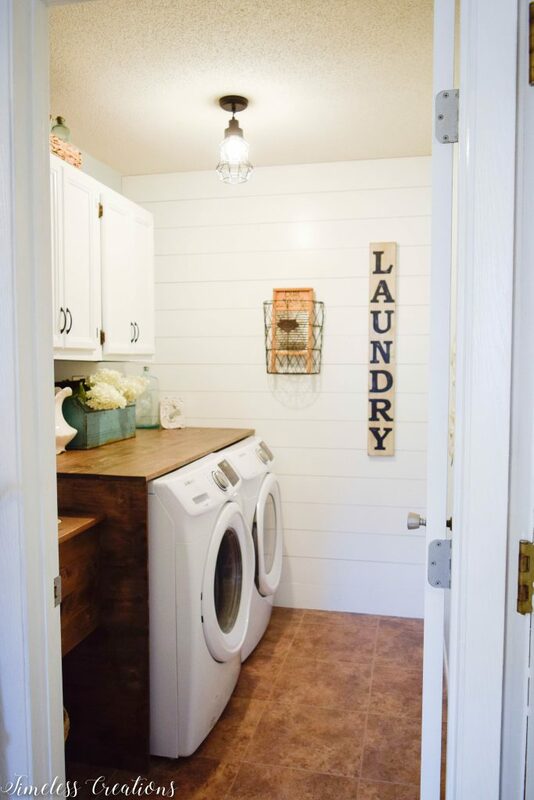 This gives me a bad case of laundry room envy! Oh thank you Meredith! 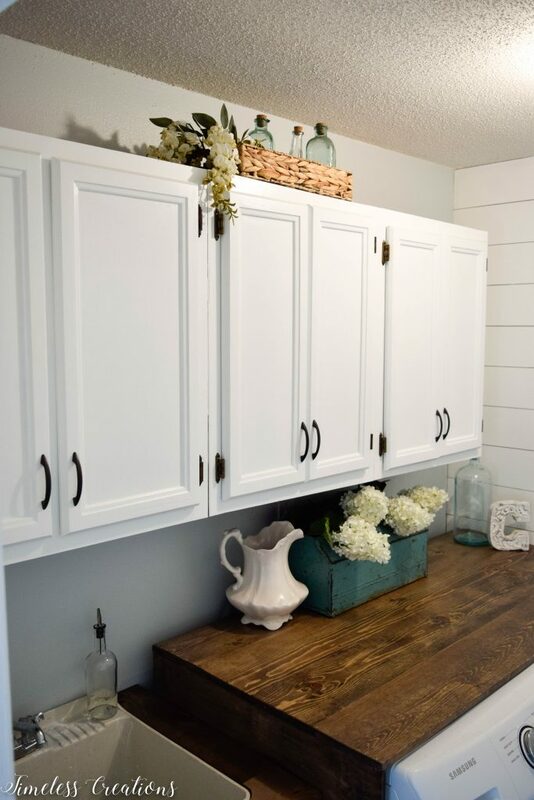 I wasn’t sure about all that wood at first but your right, it balances out the white shiplap and cabinets well! What a gorgeous makeover! The shipping, counter, and sink surround made such a huge difference! 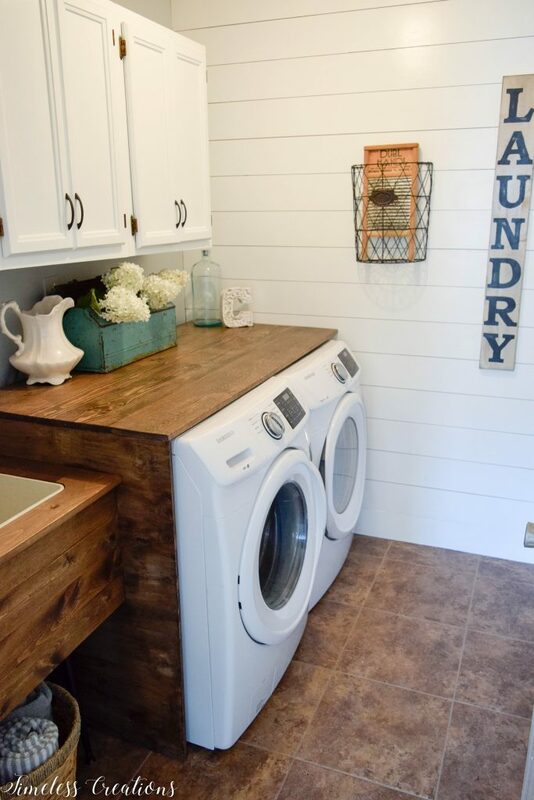 I like the wood accents on the washer and dryer. and shelf. It’s beautiful! I LOVE how you wrapped the washer and dryer. Pinned! Hi- The room looks great. Where did you get the legs for the laundry tub? An outstanding share! I have just forwarded this onto a friend who was doing a little research on this.